Last year, Arsenal were that close to signing Leicester’s Jamie Vardy for a £25 million transfer fee. But Vardy never put pen to paper. Upon reflection, between his tins of Thunder snuff tobacco and cans of Red Bull, Vardy made one of his better decisions. He realised that his limited, direct attacking skills did not fit well with Arsenal’s more intricate, build-from-the-back, short passing in tight spaces requirements. Vardy backed out of the move. Had the transfer been completed, the addition of Vardy to the Arsenal squad would have most likely cost Olivier Giroud his spot as the Gunners’ starting centre forward—at least in the beginning. So, this year Arsenal dislodged Lyon centre forward Alexandre Lacazette for a record-breaking £52.7 million transfer fee—moving Giroud even further down the pecking order. And with this latest change comes an insanely cruel irony. Regardless, the transfer of Lacazette to Arsenal has been completed, and with the imminent departure of Alexis Sanchez to a Champions League club (very likely Manchester City), a decision needs to be made. Giroud has been clear that he does not want to sit like he did last season, playing less that 1200 minutes in league play—and still scoring 12 goals in these competitions at a rate of a goal every 100 minutes! So what is to be done with Olivier Giroud? Does Arsenal try and keep him or sell him? If Arsenal sell him, what do they have left to support Lacazette? Let’s see. The primary Arsenal cast members include: (1) Theo Walcott, (2) Aaron Ramsey, (3) Alex Oxlade-Chamberlain, and (4) Danny Welbeck. And, of course, Giroud. Let’s examine what Arsenal’s supporting strike force has to offer Lacazette for the upcoming season, with and without Giroud, since it seems he has already been labeled as an excess skill set. Is it really? What do the numbers say? The goal scoring history for Arsenal’s primary strikers and wingers is shown below in Figure 1. Figure 1. Arsenal Goal Scoring Performance During EPL Seasons 2012-13 through 2016-17. There is no guess work here. Theo Walcott and Aaron Ramsey had only one single decent season. Walcott scored 14 goals during the 2012-2013 season and Ramsey, 10 goals in 2013-2014—during which he was truly brilliant until sadly interrupted by injury. The rest of their contributions during their Arsenal tenure can be easily characterised as somewhere between disappointing and forgettable. Walcott is exasperating with flashes of brilliance but mostly fizzle and Ramsey, although tireless and hardworking is only 50-50 to finish with an open net. Chamberlain and Welbeck do not display consistency—mediocre performers that can be, at best characterised as never delivering on their unrealised potential. That leaves us with Sanchez—who we know has been a stellar performer (and who has one foot out the door), and the much maligned Giroud. In fact, Giroud’s performance looks surprisingly good—although arguably not that of a top-notch striker who would score 20-25 goals per season. Closer to that of a sound, reliable, 15-goals-per-season kind of striker. Not bad at all … but not sufficient for Arsenal. In the end, it is important to understand the implications of playing Lacazette with a team that either includes Giroud and one that does not … and of assuming that an impressive goal scorer in Ligue Un translates into a similar performer in the EPL when it may not. In addition to merely viewing the number of goals a player scores, the actual number of minutes played needs to also be examined. It’s important to include the player’s time on the pitch since this reflects the opportunity to score as well. 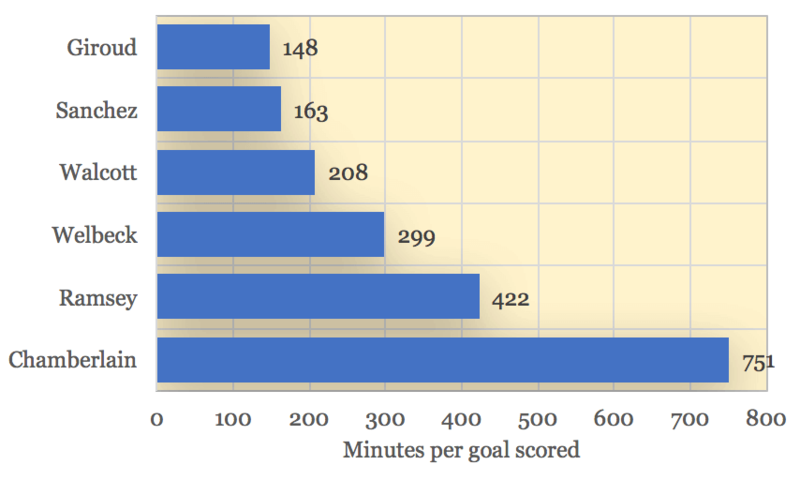 Minutes per goal scored will give us a picture of the efficiency of the player who makes the most of his time on the pitch and take into account the time in competition. This metric for the Arsenal players are provided in Figure 2. Figure 2. Minutes per Goal for Arsenal Player Careers. It might be a surprise that Giroud has the least amount of time between goals of all of the Arsenal players during his Arsenal career including that of Sanchez. Using these numbers, if Giroud was given, say, 3,000 match minutes per campaign—as he had when he first arrived at Arsenal when he was the striker of choice—he would deliver about 18-20 goals a season. He has only played that many minutes once. Based on past performance, if the same number of minutes were played by any of the others, Sanchez would average about 17-18 goals per season, Walcott about 15, Welbeck 10, Ramsey 7, and Oxlade-Chamberlain, about 4. Of course, the flaw with this reasoning is that, with the exception of Sanchez and Giroud, all of the other players have significant injury histories, so assuming they would be able to survive a 3,000 minutes’ campaign is optimistic. Also, the performances should be more heavily weighted for the more current seasons. Regardless, Giroud, is surprisingly on par with Sanchez. 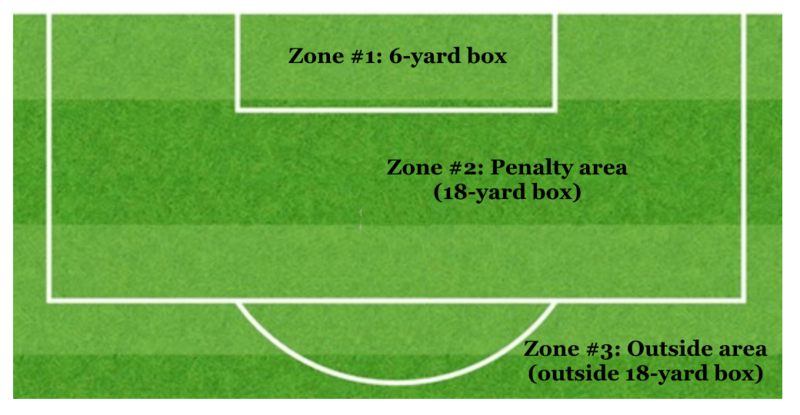 A simplified version of this method of analysis is illustrated by Paul Riley, An xG Model for Everyone in 20 minutes (ish), , posted on a differentgame blog April 29, 2017 that describes how it is possible to use the data available from the three pitch grids of WhoScored.com: (1) within the six-yard box, (2) penalty area, and (3) outside the penalty area (Figure 3). Figure 3. Three Zone Division of WhoScored.com Shots and Goals. Eight years of EPL data from the WhoScored.com database are gathered starting with the 2008-09 season and ending with the current 2016-17 season using over 82,000 shots corrected for penalties. The summary is shown below in Table 1. More sophisticated xG versions will not only include the x,y coordinate but also if the player is static or moving, open play or direct free kick, corner or cross, header or strike, type of marking, number of defenders, shot angle, velocity, etc. Table 1. Shot and Goal Summary by Zone for EPL Sea-sons 2012-13 Through 2016-17 (WhoScored.com). Aaron Ramsey’s data from WhoScored.com is used as an example next to show how to apply this method (Table 2). Table 2. Shots and Goal Locations (Zones) for Aaron Ramsey During EPL Seasons 2012-13 Through 2016-17 (WhoScored.com). or, about 99%. Ramsey is shooting a bit under what the average performance for his array of shot selections (23 actual goals scored to an expected 23.2 goals). 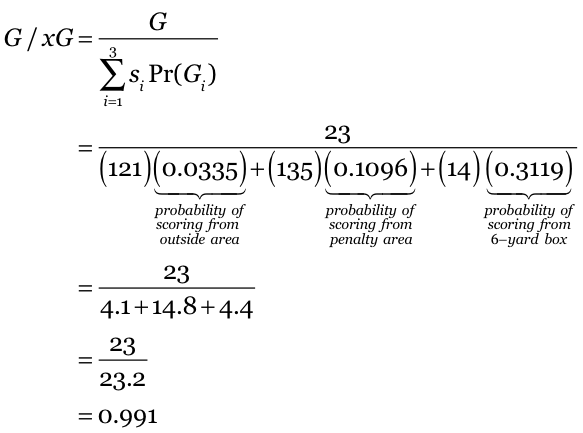 An average expected performance would be 100%, i.e., the player is delivering exactly the same number of goals as the average database performance. Anything better than an average score will be over 100%; a lower than average score will be under 100%. Now let’s examine the other Arsenal goal scorers using the same methodology. Figure 4 reveals that only Olivier Giroud and Alexis Sanchez average above 100 percent. Sadly, were it not for Theo Walcott’s one good year in the 2012-2013 season and Aaron Ramsey stellar first half of the 2013-2014 season, their numbers would be about half of what they are now. It simply boggles the mind how Theo’s agent, Arsène Wenger, and Ivan Gazidis have worked these anemic numbers into a six-figure weekly paycheck. Welbeck and Chamberlain drop off even lower. Do not overrate the value of xG: it isn’t a panacea. It may not account for the prolific goal scorer who tends to be a volume shooter. Cristiano Ronaldo is not the most efficient shooter but he is one of the greatest. He will take shots from the locker room if unmarked and sooner or later, and no matter how low the chances a shot might be from 30-40 yards out, he will make a spectacular goal. His G/xG value may be lower than quite a few players that you would not trade his shoes for. At the end of the day, the most telling metric is still how many goals a season a player can consistently score. It is difficult to overlook the clear and consistent message the numbers are providing. The productivity of the actual goals a player scores, as well as the number of minutes needed between goals (to account for the possible limited opportunity for players who are not in the starting eleven or are not available due to significant injury during the season), along with the efficiency suggested by the expected and actual goals scored based on shot selection, xG, consistently show the distribution of Arsenal players lying in approximately the same pecking order of accomplishment. One of several possible illustrations of these measures is shown in Figure 5. The size of the circles shows the total goal count of each player. Of course, you would expect that the longer the tenure at Arsenal, the larger the number of goals scored, except it really isn’t that consistent. Only Giroud and, of course, Sanchez are reliable goal scorers. The rest pale badly by comparison. The other parameters show the same lag in performance, e.g., Sanchez and Giroud need far fewer minutes between goals (163 and 148 minutes, respectively) and also both generate considerably above their expected number of scores, xG—143% for Giroud and 154% for Sanchez while the others do not. Keep in mind that during this last season, Giroud’s usage sunk to a new low. And it was not due to injury or international duty. He has simply fallen out of favour with Arsène Wenger. As a result, Olivier Giroud played less time than any other player in the group with the exception of Danny Welbeck who truly was out due to injury, yet Giroud still managed to score 12 goals! As a group, Oxlade-Chamberlain, Ramsey, Welbeck, and Walcott combined to score a grand total of 9 goals in over 4,700 minutes—over 520 minutes per goal compared to Giroud’s 99.6 minutes per goal. It is astonishing that Arsenal might even consider letting Giroud leave, regardless of if Sanchez stays or not—no matter that Lacazette is now a Gunner. The adjustment between Ligue Un and the EPL is not necessarily a smooth transition. And for some hand-picked Wenger choices, like Gervinho (Lille), Marouane Chamakh (Bordeaux) and Yaya Sanogo (Toulouse FC), the transition never happened. Giroud’s ability to hold the ball, to play with his back to goal, and aerial play is exactly why Didier Dechamps keeps Olivier Giroud as France’s starting centerforward. Possibly, it might be a good time to consider how both Lacazette and Giroud might work together to make the lacklustre Arsenal attack a more formidable threat for the coming season rather than relying on life without the bearded Frenchman. It was noted that caddy does not fit Arsenals system. Well neither does Giroud, brilliant with his back to play and holding up the ball. So why did we buy Ozil to provide creativity to a player who sits 2 yards in front of him not making runs beyond him. Also the stats surely can’t show what Giroud would be like at scoring if Arsenal had some true wingers who hugged the byline and loved to put in crosses for him rather than cut inside and play the ball to feet that is just not Girouds style. Awesome striker miss matched system but all anyone sees is his strike rate. But how many more could a striker at Arsenal score if they fitted the system played. I appreciate your insights, John. Here’s my take. Giroud is, indeed, not a panacea and was never presented as such. My intent was to show that he is not deserving of being an “after thought.” Wenger gives far more (undeserved) opportunity to Walcott and Ramsey—two players who are need of Google Maps for the location of the goal. Clearly, you will not see vapor trails left by Giroud’s sprints but he is outstanding at keeping possession and passing in tight spaces which Lacazette does not … although Alexandre does move the ball well from the wing. Also, Lacazette needs far more touches to make something happen than Giroud. About double the touches for open play scores (Don’t forget that 10 of Lacazette’s goals were penalties). However, my primary point was not trying to pump up Giroud’s numbers, but to show that Arsenal would be far better off if Wenger would include him more … to consider the opportunity of playing Giroud along with Lacazette. It’s my guess that they could form a partnership of far greater value to Arsenal than Lacazette operating alone. You will notice that I have left Sanchez out of this equation because regardless of Mssr. Wenger’s claims, when Guardiola ups his offer closer to £55m, Arsene will help Alexis pack his bags and call a cab. 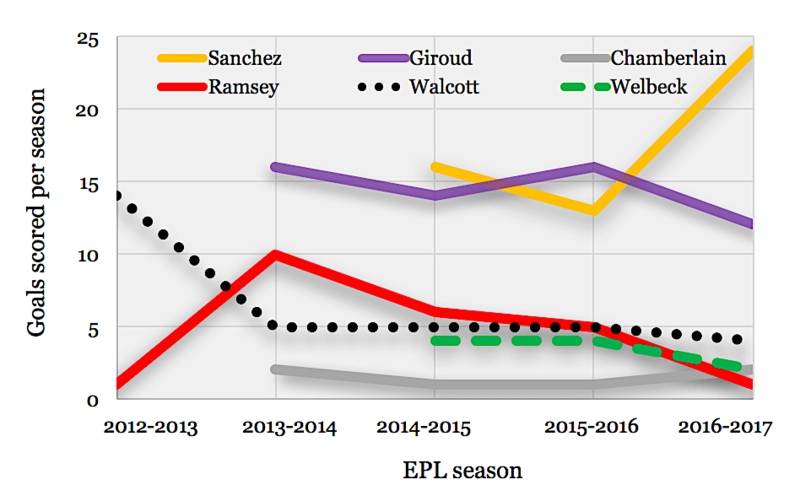 Not sure why Giroud should be compared with Walcott and Ramsey – these two players are not always on the team because of what number of goals they can produce. Well Walcott as a forward should produce goals but I think Walcott is on the pitch for the pace he brings to the team far more than his goals. Ramsey shouldn’t even figure in, his job is that of a midfielder. He might be a goal threat but that is not his primary job description. Giroud with Lacazette as you have pointed out will be a good option, instead of Lacazette alone. I thought this information was exteremly insightful. It’s just the facts. Money Ball… anyone? If i were Giroud i would have found another club, particularly a club that likes to play a well rounded game of soccer. Giroud is a threat, he is creative, and most deliveries become goal scoring oppertunities when he is in the box. While, all those other blokes (omit sanchez) don’t seem menancing at all. If i was a defender i would hate to guard him becuase he can make a goal out of most unplayable services. Categories: Arsenal, Arsenal (NN), EPL Index Featured Article, and EPL Index Statistical Comparisons.' 'Tags: AFC, Arsenal, Arsenal (NN), Arsenal Stats, english Premier league, English Premier League Opta Stats, English Premier League Stats, EPL, Giroud, Giroud Stats, Lacazette, Olivier Giroud, Olivier Giroud Stats, Opta Stats, premier league, and Premier League Stats. 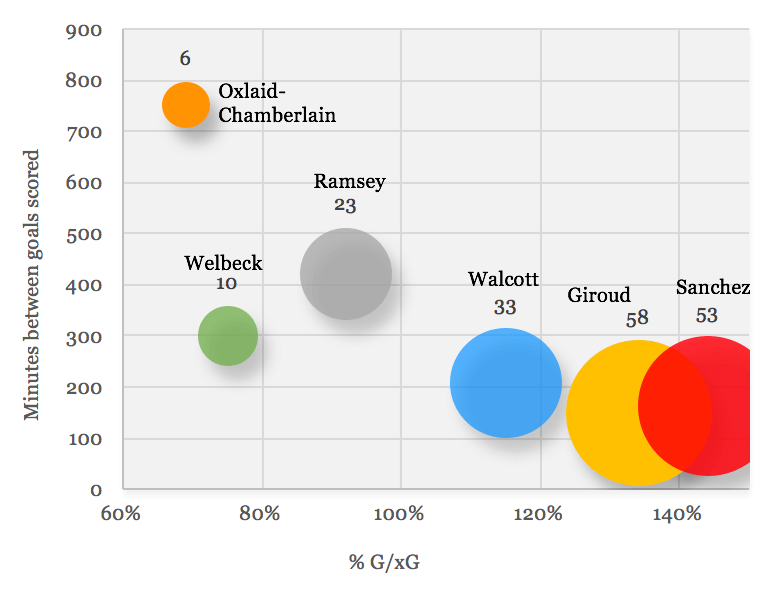 Olivier Giroud vs Danny Welbeck: Who Should be First Choice?